NHL News : Huge new wrinkle in the John Tavares trade rumors. Huge new wrinkle in the John Tavares trade rumors. If you had asked me 3 years ago if there was any chance that the New York Islanders would be trading star forward John Tavares at any point in the future I would have laughed, and I would have felt extremely confident in saying "no." That being said things around Tavares have been anything but cut and dry as of late, and it seems like the momentum towards an eventual trade has been building and building over time, and now it seems more likely than not that he will in fact be traded this summer. If you had asked me two years ago if there was any chance at all that the New York Islanders would allow Tavares to enter this current season without a new contract already secured, again I would have felt extremely confident in the "no," you would have received in response. 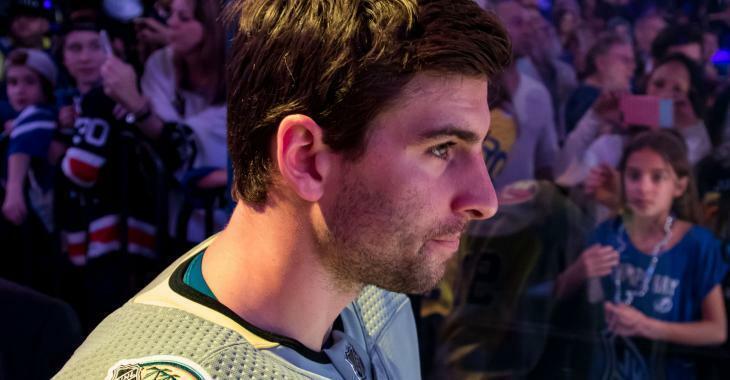 However despite the fact that the Islanders themselves had hinted that they wouldn't allow this scenario to unfold, Tavares did enter the season without a new contract. If you had asked me just 2 months ago if I thought there was any chance that Tavares would be a New York Islanders beyond the National Hockey League's trade deadline, when you consider the fact that he had not signed a new deal, again I would have been very confident in the "no," I gave you. Despite that the trade deadline came and went and the Islanders seemed perfectly content to risk losing their very best player for absolutely nothing this summer. So why in the world would the New York Islanders take such a risk? Well as it turns out there may be more than meets the eye here, and perhaps unsurprisingly it seems like New York Islanders general manager Garth Snow may know something we don't. In fact it sounds like the Islanders may be guaranteed to get something out of this deal no matter what happens this summer. During Thursday night's edition of Insider Trading on TSN, the insiders revealed that there may be a new wrinkle in the trade rumors surrounding the Islanders captain, a wrinkle that would appear to indicate there is a high likelihood that he will in fact be traded by the Islanders at some point during the summer. TSN insider Pierre LeBrun revealed that both Tavares and the Islanders may be looking at some type of sign and trade deal even if he were to decide to leave to another team, a deal that would guarantee the Islanders some return for their All-Star captain. "If he does decided to leave Islanders, and he hasn't made that decision yet, a sign and trade; we haven't had one in the cap era this would be exciting... It's a possibility," said LeBrun. So it's clear why the Islanders would be on board with this idea, but why would Tavares himself be open to the idea of costing his new team some potential assets in order to help the Islanders, a team he presumably won't be playing for in the future? "I can tell you this, this is why it would make sense under certain conditions. It would be about John Tavares wanting the eighth year on that contract which he can only get by signing with the New York Islanders and being flipped to another team." So that covers the Islanders and Tavares, by why would a team trade for him when they could just sign him as a free agent? Well there's an advantage there as well. "If you're the team acquiring him, the eight year would lower the average annual value, lower the cap hit on what you're paying him." LeBrun believes that a sign and trade is now "certainly a possibility."